Completely furnished home with full kitchen and laundry. Now has WIFI! Please avoid leaving a "Single Night Gap" June- Sept. Please avoid a Single Night gap May - Sept. & Spring Break. Summer 2019 (July & Aug) 3 nt min unless filling a gap. Memorial Day & Labor Day Weekends 3 nt. Min. "We very much enjoyed our stay at the Nantucket. It was perfect for a romantic long weekend at the beach!" "this place was clean and comfortable. nice hot tub. I would just update some of the art work and get new drinking glasses. I notice things like that, otherwise, great stay! Thank you. " "This is a very nice little house with a full functional kitchen plenty of space for 2 and the hot tub made it well worth the money." "This was a great place. Clean and well supplied. Everything we needed was there. Great location. Great hot tub! What more can you ask for. We would definately stay again." "The only thing that would improve this location would be to demolish the condos that are directly in front of the property. The block the view! Overall, very nice property and very close to beach access! Great place!" "Great relaxing experience, what a wonderful three days. The house was fantastic, the location was great, had a fantastic time. Only one minor complaint, implode the condos across the street so the view is better." "Nice but miss seeing the beach"
"It was a cute house with alot of character. We enjoyed the Hot Tub but the view was not very good. (privacy) could have been better. But overall a good stay." "Very relaxing, just what we needed. Too bad for the view being blocked from the house and lower deck but overall a great stay." "The only reason we didn't give this 5 stars like our previous stay is that the hot tub wasnt usable until later in the day on our second day. It was cold when we arrived the first night and took almost a full day to heat back up. My guess is that they forgot to turn the heat up after they added cold water. Other than that, we love this little place. Perfect for two people." "Great place, definitely going to stay again!" "Beautiful weather, cozy house, great vacation. "Our stay was comfortable and relaxing. I do have a couple of complaints though. After using the hot tub two days in a row I started breaking out with a rash. I went to Urgent Care the following week and found out I had FOLLICULITIS. The doctor told me it is very common amongst people who use hot tubs while vacationing. I have stayed at many vacation properties with a tub and never had anything like this happen. The only other complaint I had was the shower curtain rod had sharp edges and was rusty. I would replace it if I owned the property. We did enjoy our stay though." "I have no complaints... Everything was perfect... We will be back"
"We had a lovely stay at Nantucket! The cottage is clean and cared for. The only thing is the bed needs a new mattress for a more enjoyable sleep." "Overall we enjoyed our stay. It was very clean and the house is definitely spacious. There is no Ocean view though and no easy Beach acsess. But we loved the patio downstairs by the jacuzzi. It's fairly quiet and private. We liked the house and would probably stay there again." "Had wonderful time. The home was cozy and warm, clean and neat. It was the perfect place for me and my boyfriend to spend a nice romantic vacation. " "A few school friends came to see me in Lincoln City. I rented Nantucket as my "extra bedroom and bath" as I live just up the street. What a charming beach house! Old school and I loved it. More importantly, my guests loved it." "The cottage is very nice and cozy and walkable to shops, restaurants and beach. The hot tub and decks are awesome (though ocean view is limited). Would be great to have a digital music docking station instead of only a boom box, as radio stations are scarce and most people don't travel with CDs anymore. We found it annoying that the guest book instructed us to strip the beds, start the laundry and take out the trash, even though there is a mandatory cleaning fee. Overall though, a really pleasant experience." "Upon arrival of the Nantucket we were pleasantly surprised at how true to the photos the place was. It was adorable and very comfortable. We enjoyed the two decks - morning coffee on the upper deck and afternoon/eve hot tub and drinks on the lower deck. The Nantucket was appointed with all we needed. We were surprised however that no windows opened to let the sea breeze in - other than that it was a lovely place to relax. " "Spent 3 days/nights here and it was a very pleasant experience. House was close to the beach, dining places, shopping and was in a pretty quiet neighborhood. Hot tub outside the bedroom was a very nice touch. Only negative was bed mattress was to soft. A firmer mattress would have been nicer. So I give the place an 8.5/10 rating. Would be a 10/10 with a firmer mattress to sleep on. Still we thoroughly enjoyed the place and we'd definitely stay there again without hesitation." "Excellent! We loved that little place and plan to stay again. However, there were a few things that we disliked were that the windows don't open, there was no cable box in the bedroom, and finally that there is no toiletries in the bathroom. " "The home is just right for 2 people; cozy with good amenities. Wish there was a view, but we could hear the ocean really well. We would definitely consider renting again in the future, and the staff made reservation easy. Thanks!" "Booking and check-in process super easy. House is a good size for a couple and has a fully stocked kitchen. Location is great and the hot tub is a bonus, even though I never used it. My only complaint would be a bigger tv for the one rainy day I had. We had a great time and will stay here again when we are in town." "Had an amazing 3 day birthday vacation...absolutely loved this home...wished they had Windows...not far from the was great"
"My husbands birthday surprise. Very vomfortable and needed relaxation every thing was wonderful and we wanted for nothing enjoyed our stay very much. " "Great location very walkable to the beach. Clean, cute cottage! Perfect for 2! Romantic!" "We loved our stay at the Nantucket! It was a beautiful place in a great location. Beach across the street but the privacy of your own house. From the fully equipped kitchen, comfortable bed,cable TV and an awesome hot tub in the perfect place for privacy. I strongly recommend this beach house and loved our stay!" "Cute quite little home. Very clean. Perfect home for couples romantic getaway. Jacuzzi clean and private. Perfect for a midnight soak. The Nantucket is best home for me and my mate. This was our second summer here and weplan on having many more summer vacations here." "My Husband and I stayed at the Nantucket for our one year wedding anniversary. I honestly did not want to ever leave! This little cottage is the cutest thing ever along with just amazingly comfy clean and cozy! I cannot say enough about our experience from the people at A 1.. extremely helpful and the home itself made our weekend perfect! We could not of asked for more.. the size of this place is perfect for two, we hardly left the house. We gave up the super great beach view for the quaintness of this and for the hot tub.. etc. No regrets. Coffee in the morning on the deck, perfect! A fire in the wood burning fireplace in the evenings.. perfect. Cooking in the kitchen..perfect! The bed was incredible even down to the super comfy soft sheets! We made a very small contribution to the home :) All of the drinking glasses in the kitchen were small juice type glasses and my Hubby loves a larger glass so we went to the store and purchased two taller glasses and left them there. Anyone even considering staying here just go for it! Not sure why anyone would of left a bad review :( "
"Despite this not having a view of the ocean it was a great location with easy access to the beach. The house is well stocked allowing the ability to cook meals at home. It was well kept and very clean"
"Great beach rental that was located nicely in Lincoln City! Walking distance to beach and downtown. Very nice neighborhood. Perfect for the two of us!!!" "Overall we enjoyed the house. It had a great location for restaurants and beach access. We had beautiful but cold weather so sitting outside in the hot tub was especially enjoyable. The house was clean and well organized. The instructions we received for access, operation, and check out were spot on. instructions posted around the house for TV/Video operations were also helpful. Kitchen pots/pans/utensils/glassware were very functional. My one comment is that the property and furnishings are just older and in need of updating,however everything worked fine. WIFI was fast and reliable. The shower, while functional is extremely dark and has a low ceiling. I am 6'2" and I had to crouch slightly to avoid the ceiling. It was cold this weekend so keeping the house temperature regulated had some challenge ( untimed thermostat ). That said, we would rent it again and recommend it. " "We definitely enjoyed our 3 day/2 night stay!!! Everything we needed was available to make meals, loved the wine glasses and Hot tube which was nice and private!!! Thanks for sharing your beautiful beach house with us, we want to come back!!!" "House was clean cute little home. Location was great. I wanted to board my self up and never leave. I could relax every nite in the hot tub. The one draw back wet wood stairs with dress shoes bad idea. I think they could put some kind of non slip tape like skate tape or something. I fell hurt my hand and back but I wouldn't have traded the trip in for anything. I am so happy the rented this home out. Thank you sincerely. " "We stayed here for a couple of nights. It was very relaxing the cottage had everything we needed. " "We had a wonderful and relaxing time staying at the Nantucket. It is in a great location and has many wonderful features!" "We stayed 3 nights. The home was beautiful and the kitchen was exceptionally equipped. The hot tub was clean and very relaxing. We would love to make this an annual event!" "Had a great time there for my wife's birthday very nicely located and very quiet." "Nice atmosphere. Close to shops, casino and beach. Hot tub was great but the top was broken and hard to remove and main lights did not work (tried every switch we could find). " "This was our third stay at Nantucket cottage. Every experience has been positive and memorable. We kayaked on the Siletz at Coyote Rock RV Park and did some boogie boarding at 11th street beach access. Also had our second glass blowing session at Jennifer Sears glass studio." " We arrived Monday night the 30th unloaded the car got to watch some of her game notice the road was tore up in front of the house can figure out what was going on to only be woke up at seven in the morning to loud cranes and trucks. The noise was so loud the dust was horrible we could not enjoy the deck or the hot tub so we left and went to our friends house and stay there all day came home around 4:30 PM to only be told that we couldn't get to the house go down the street they yelled at me and screamed at me I got out and said my beach house rental is on that street and this is not right . Finally one of the workers took me down a road only to go all the way out of my way just to get to the house then when I got to the house where I was supposed to park was all tore up so was hard for me to get my little car up in there to once again be disappointed because of the dust in the loud noise so we left the next morning early wouldn't even use the house weren't offered our cleaning deposits or anything for our troubles but they did say Sorry and they had no idea it was being done." "My husband and I had a fabulous weekend staying in this cute, cozy beach home. The beach was just steps from our door. The upper and lower decks were perfect for soaking up some rays. The hot tub was the best part! We will definitely stay here again, highly recommended!" "This little cottage was the perfect place for our 20th anniversary weekend. A short walk to the beach or the shops and just a quick drive to the casino. Loved being able to get in the hot tub after a long day of playing in Lincoln City. One suggestion: The bedroom needs a DVD player. Overall we had a great stay. Would definitely recommend this place to our friends and families for a couple's weekend." "Very great stay. Only downside was hot tub cleaner showed up around 10am to start cleaning it. Felt pressured to hurry up and get out. Probably be best if they showed up at 11 instead of your guest seeing a random woman creep up the side of the house to the hot tub. " "My husband and I never received a honeymoon last year when we got married. So for our 1yr anniversary we made a point to pick a location that was easy access to the beach, that had a hot tube and overall gave us an opportunity for a relaxing time. We have nothing horrible to say about our stay we spent a lot of time in Newport and sadly didn't get to enjoy the house as much as we would have liked, however it was so relaxing to come back to peace and quite from our long day. We were able to locate a few local food places and had an overall great time. " "The place nice and convenient. I was hoping for a view of the waves from the porch/patio, but I guess the condos across the street got that. There were more stairs to the front door than I was expecting, and for seniors, that is an issue. Otherwise, our stay was great!" "We had a wonderful time. Bed was very comfortable. Decided to not cook but everything was available that we needed. " "Wonderful experience! No complaints, neat ocean, nice hot tub, clean and good staff. " "Nantucket is one of our favorite places to stay in Lincoln City. It's perfect for a weekend getaway with my husband. I just wish we could stay even longer." "The Nantucket is a nice old cottage. Even though the view was not good we did enjoy the stay. A short walk to the beach and the upper deck would be great in the summer. The bed is comfortable and the French doors out to the hot tub is great. It was great to have the laundry available but the cleaning staff needs to pay closer attention to detail. The lint trap was so full it was very difficult to remove to empty. There were cobwebs from just about every light fixture in the place. There is some much needed maintenance that needs to be done. The gutter just above the hot tub is ready to fall off and on the last night of our stay the roof was leaking in the dining area. All that said we did enjoy our trip and would stay again. " "The rental was great me and my wife enjoyed a lot. The rental is perfect for two people very warm and cozy." "Couch pretty well broken down and lacked kitchen silverware, old toaster and coffee pot too small." "Awe lovely will rent again clean big cozy fur two good parking plenty towels hit tub awesome roof top deck so enjoyable"
"We had so much fun, nice cozy get away! Place was clean, "
"I loved our stay at the Nantucket! The place was clean and perfect for just the two of us. The hottub was an added bonus and the bed was very comfortable! They could invest in some new cooking pans though! Other than that we loved our stay and will be staying there again!" "We had a fabulous time! At first I was reluctant because of how close the hotels and other rentals were to our house but once we got inside you could hardly hear anyone else. The kitchen had all the things we needed to cook during our entire stay including supplies to clean with. The bed was amazing and soft! The towel situation was on point! The hot tub worked and the top balcony view was a great place to watch the sunset. We will definitely return!" "We enjoyed a laid back vacation in Lincoln City. The only potential issue we really had with the rental was parking. Parking was on the street in front of the rental in a gravel pull out. The rental agreement stated very clearly that only 1 vehicle was allowed. We were called by the landlord asking us to be willing to share our parking spot woth another renter that was staying nearby. Even though we never saw a car, we thought this was a bit rude to require one car but be willing to potentially share an already small parking space." Love this house like it was my owm"
"Had a fabulous time again in this cute little house. Nice and roomy with a wonderful King bed and a hot tub to enjoy the outdoor patio. Even though there is not a view of the beach, you can still hear the sounds and make a short walk to get to it." "Loved this sweet little place. Had our anniversary weekend here and it had everything we needed (except sugar for big deal). So comfy and hot tub was awesome after a chill day at the beach or hike to Cascade head. Also AMAZING location, 2 blocks to shops, bars, beach access, and restaurants! We loved the Nantucket and will absolutely be back!" "I loved this house it was phenomenal it was cozy the hot tub was awesome I will stay there again"
"Loved the house and experience "
"Warm and comfortable home away from home. "Perfect place for a couple! It's cozy, but doesn't feel small. Had a romantic feel about it. A small Oceanview from the upper deck, but we weren't really comfortable going up there as a newer rental is right behind with a window overlooking the deck. We loved how near it was to walk down to beach. Also loved the French doors going out to the deck and hot tub from the bedroom?. Lots of movies, would've been nice to have some Romantic choices. Bed very comfy! "We rented Nantucket for our honeymoon, thinking it would be a good alternative to some of the more expensive ocean side motels in the area. We are so happy to say it was so much better. It was charming, just as described, and unlike a hotel it offered more privacy. There was a storm the night before we got in, and it caused issues with the hot tub. But Karen called us before we even arrived to let us know about the issue and that someone would be out the following morning to fix it. The beach is just a short walk from the rental, but if you are out of shape like me you can even drive down to the beach and park right on the sand. We enjoyed eating at Mo's and Kyllo's and surprisingly Pig n' Pancake. We also drove down to Depoe Bay and did some shopping there. I also really loved having a washer and dryer in the unit so I didn't have to bring home dirty laundry! Only down sides, if you are taller than 6' the shower is going to be overly cramped, and when walking from the living room into the bedroom there is a 8-10" step that can catch you off guard the first few times." "We loved Nantucket! Very homey, comfortable, relaxing, convenient location. Clean, well equipped. Loved the hot tub and fireplace! Will definitely be back and highly recommend. " "Had an amazing weekend escape at the beautiful Nantucket. Lovely home and amazing hot tub. Had a fantastic time." "We love this home as it was our own. Owner is super caring and easy to work with. We will be returning again." "It was amazing /relaxing /home had everything we needed and more. " "This is a very cute/cozy home; just the right size for two people. There is a hotel across the street from it however, so you do not have a clear shot view of the beach, but it's still a great location. At either end of the street you'll have beach access, and one of them you can even just drive your car onto the sand! You're very close to everything as well within the city. We did notice the fireplace was never cleared out before we arrived, but it was not a big deal since we decided to not make one ourselves over our stay. Aside from that, the hot tub was amazing, the king bed was extremely comfortable, and the home is fairly well equipped (no dishwasher though). We had a great birthday vacation, thank you!" "It was a great place to stay with a wonderful hot tub, ample space and good location. It was perfect for two people. The only thing missing was there was no soap for the shower. We will stay again. " "Very relaxing trip with my teen daughter. 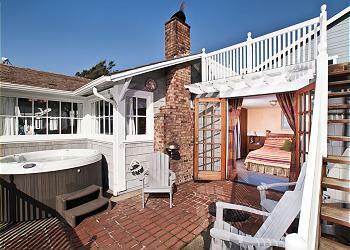 It was a perfect cozy getaway and loved the hot tub and short trip to the beach!" "This quaint space was exactly as it was advertised...a perfect place for 2 and apparently a great anniversary getaway based on the guest book. The bed was cozy, the hot tub was awesome and we actually sat in the sun on the upper deck. So close to the beach access and we walked to dinner most evenings. It's not fancy but a very nice cabin 'feel' and a special place we'll come back to. " "The Nantucket is very cozy and the perfect size for two. The location is great for walks to the beach or short drives along the coast line in either direction. Would stay again. Thank you for such a gift. " "we enjoyed our birthday getaway ,,,may come back again sometme"
"The Nantucket is perfectly situated just a couple of blocks to the beach! The hot tub was LOVELY as was the fireplace! We enjoyed a number of amazing, local restaurants. I was able to schedule a deep tissue massage at Back In Touch during our stay. UNFORTUNATELY, there was a dead rat in the bathroom upon our arrival. This was quite unnerving. Karen had someone come and remove the rat within a few minutes. She apologized and advised that rats are common at the beach. My negotiations with Karen to be fairly compensated for this disturbing situation were fruitless. (In addition, there are no openable windows in the cottage for ventilation. The sofas are old and smelly.)" "Very cute beach rental. Just enough to feel at home and not much extra. The shower was very small. The fireplace was grt. " "The Nantucket Cottage is absolutely delightful. It isn't pretentious or grandiose, but what it is is perfect. The photos are not doctored, what you see is what you get. You can't always SEE the ocean, but you can hear it when you want to. The hotel across the street isn't awesome, but you can't hear them. Traffic is minimal, the kitchen is small but well-stocked, and everything worked the way it should. We will be back!"